This beautiful arched bridge in Lake Austin (Texas) was a private build by Miro Rivera Architects and is used to connect the client's main house to the smaller guest house on the other side of the water. The idea was to make the bridge seem as natural as possible within its surroundings and to do this they made the decking and reed-like hand rails as imperfect as possible. 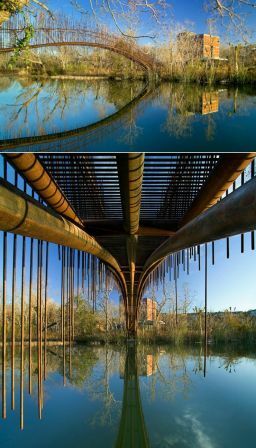 The result is a bridge that looks extremely fragile but definitely worth the risk.